Digital watermarking is a key ingredient to copyright protection. It provides a solution to illegal copying of digital material and has many other useful applications such as broadcast monitoring and the recording of electronic transactions. Now, for the first time, there is a book that focuses exclusively on this exciting technology. 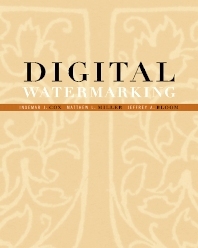 Digital Watermarking covers the crucial research findings in the field: it explains the principles underlying digital watermarking technologies, describes the requirements that have given rise to them, and discusses the diverse ends to which these technologies are being applied. As a result, additional groundwork is laid for future developments in this field, helping the reader understand and anticipate new approaches and applications. Emphasizes the underlying watermarking principles that are relevant for all media: images, video, and audio. Examines copyright protection and many other applications, including broadcast monitoring, transaction tracking, authentication, copy control, and device control. Presents a series of detailed examples called "Investigations" that illustrate key watermarking concepts and practices. Includes an appendix in the book and on the web containing the source code for the examples. Ingemar J. Cox holds a B.Sc. from University College London and a Ph.D. from Oxford University. He worked at AT&T Bell Labs from 1984 until 1989 and in 1989 joined NEC Research Institute as a senior research scientist. From 1997 to 1999, he served as CTO of Signafy, an NEC subsidiary responsible for commercialization of watermarking, In 1999, he returned to the NEC Research Institute as a Research Fellow. Professor, University College, London, U.K.
Matthew L. Miller began working in graphics and image processing at AT&T Bell Labs in 1979. He obtained a B.A. in cognitive science from the University of Rochester in 1986, and has subsequently written several commercial software applications and delivered lecture courses at a number of universities in Europe. Since 1993, he has worked as a researcher at NEC. Jeffrey A. Bloom, a researcher in digital watermarking at the Sarnoff Corporation, began working in the field in 1998 at Signafy, Inc. and later at NEC Research Institute. He holds B.S. and M.S. degrees in electrical engineering from Worcester Polytechnic Institute and a Ph.D. from the University of California, Davis. Dr. Bloom has expertise in the areas of signal and image processing, image and video compression, and human visual models.